We specialize in computer software and hardware for the grocery and restaurant industries. Whether you own a single store or a chain of stores, we provide you with both turnkey and customized solutions for your retailing business. Along with our extensive network of partners, we are dedicated to building longterm relationships of trust and confidence with all our customers. We are committed to providing worry-free after-sales service available 24 hours a day, 7 days a week, and 365 days a year. With our Preventive Maintenance service contracts, our clients have absolute peace of mind. Our flagship products are the IT Retail™ software suite for operating groceries and supermarkets. As resellers of these packaged solutions, we provide extensive customizations to suit our clients’ needs. 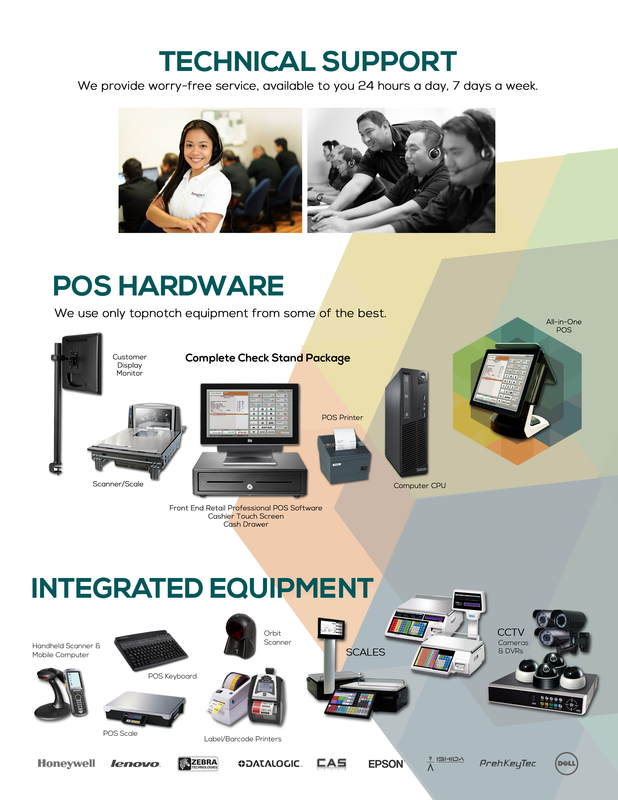 Simpleware Incorporated uses top-rated, quality branded equipment available in the market. We partner with manufacturers such as DELL®, EPSON®, PSC®, M-S®, PREH®, ZEBRA®, and METROLOGIC® for their reliability in ensuring the smooth operation of our clients’ businesses.